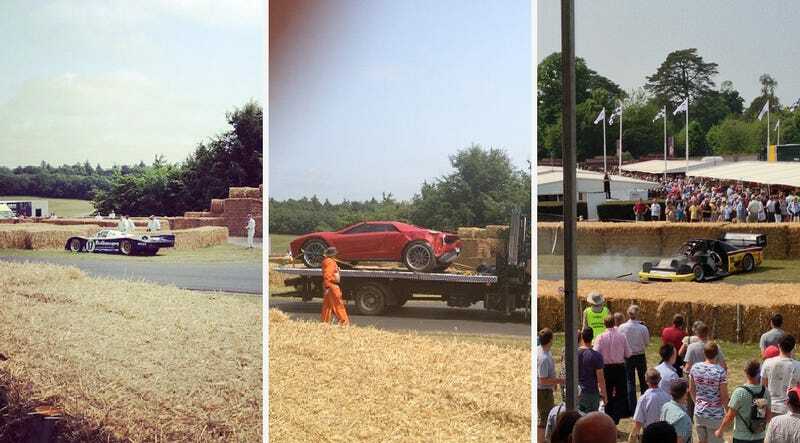 The Goodwood Festival of Speed started this morning and already three cars have crashed. Two racecars and one concept car. How many more wrecks can we expect? The Rod Millen Pikes Peak Toyota Tacoma. Zero 2 Turbo reports that the first car to crash was the Porsche 962, which was going quite slowly. GT Spirit posted the above picture to Instagram, and driver was fine and the car only got slightly damaged in the nose. The second crash was the Giugiaro Parcour. As you can see in this Instagram by GT Spirit, The concept car sustained enough damage to the rear that it had to be taken off the track on a flatbed. We don't know the condition of anyone inside. The 1,000 horsepower Pikes Peak truck crashed third, clipping the grass at about 90 miles an hour. I can understand the Pikes Peak truck crashing, as it is unofficially the Most Difficult Car To Drive In The Entire World. This picture from Zero 2 Turbo shows the front split off from the rest of the car, and one eyewitness reported that the car nearly went through the hay bales and into the crowd. The crowd stepped back, however, and no one was hurt. How would you feel about taking an F1 car up the hill now?